Mike Russell, one of the first photographers to embrace digital technology in Britain, has died from prostate cancer diagnosed three years ago. He was 57. Russell started out as a junior press photographer in the mid-1970s working on a local weekly. After too many Womens’ Institute assignments he left to be an assistant to a London still life photographer and spent many years working in advertising. Mike Russell at a Polytechnic of Central London reunion lunch, April 2011. Photo © Paul Hartley. A founding member of the AoP Digital Imaging Group and a great host, Russell held many meetings for the group at his Mouse in the House studio in Acton, West London, where he provided good beer, good company and good humoured encouragement to sort out the many issues that arose with the introduction of digital imaging. Also a founding member of the digital imaging list Prodig, Russell was at the forefront of setting standards that are now the basis of all of our digital workflows. Mouse in the House was a genuine pioneering company using one of the first Leaf multi-shot backs. Aspiring photographers were offered work experience at a studio which supplied images to campaigns for Volkwagen, John Lewis, Peroni beer and Liberty. Russell’s true passion though, was for environmental issues and he covered many demonstrations and peace camps, often placing himself in dangerous situations to get the shot. Street photography was how he described it and he would fiercely defend photographer’s rights to photograph on our streets without police harassment. At the Climate Camps Russell devised a system which allowed media access, enabling photographers to get their pictures, while also protecting the privacy of the campers who wished not to be filmed. Despite getting endless stick from both sides he rose to the challenge with his characteristic good humour and extensive organisational skills. “Mike had come to terms with his approaching death with the acceptance and the courage of a person who’d led a fulfilled life,” said Paul Hartley, who attended the same BA degree course in photography at the Polytechnic of Central London in the early 70s. Mike Russell was buried in the presence of his close family at the Chiltern Woodland Burial Park, Buckinghamshire on August 8th 2011. 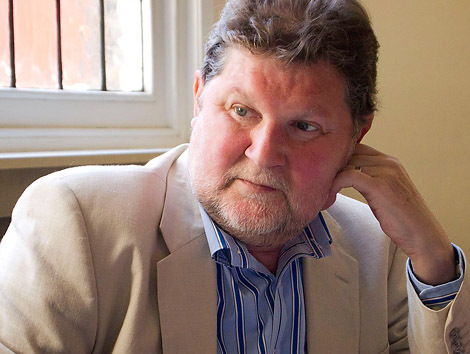 Mike Russell, digital pioneer, environmentalist and valued member of EPUK, born 1953, died 2011. He leaves behind his wife Tessa, one son (26) and one daughter (23). • With thanks to Paul Hartley, Bob Marchant, Ian Reynolds, Guy Smallman and Paul Webster. When I first arrived in London, I did work experience with Mike which led to me assisting him on a couple of jobs. He was a sweet generous guy and a real photography enthusiast. Condolences to his family. Mike let me spend a week work experience with him after he came to visit us when I was at Falmouth in 1999. He introduced me to Prodig and him and his wife were very accomodating to me while I was there. He has been very helpful on and offlist on Prodig and EPUK to me and many others over the years, and is greatly missed. He is a digital pioneer in the UK and has helped many to grasp the steep digital curve.